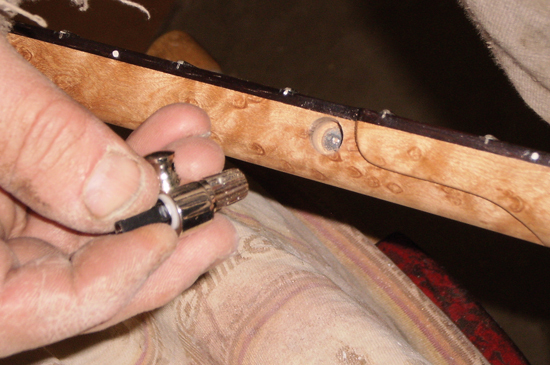 The fifth peg hole holds the fifth string tuning machine, sometimes called the fifth peg. This is a hole in the side of the neck just above the fifth string bump out. Take a look at a fifth string machine tuner and you will likely find that it features a tapered and knurled shaft that will be pressed into the hole that will be drilled into the side of the neck. Look at the small end of the knurled shaft, find a drill bit that matches that diameter. The neck will have to be set on its edge on the drill press table. I usually just hold it in place with the hand that is not operating the drill press lever, but work up a clamping arrangement if you wish. Go easy and don’t use too much pressure. Remember the reinforcement bar of hot rolled steel we put in there? It’s okay to bump up against it but don’t drill through it. 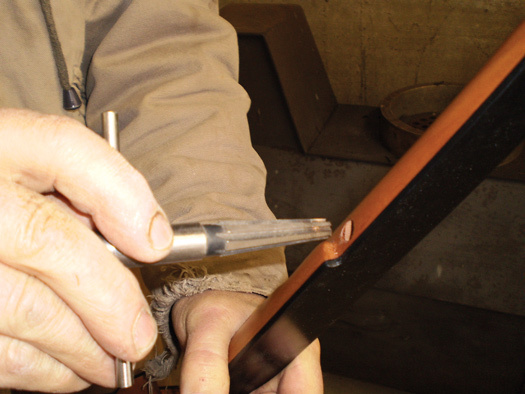 Be careful of the angle of the neck if you are holding it by hand as it may have a tendency to roll as pressure is applied by the drill bit, which could end with the drill bit coming out of the surface of the fingerboard. Pay close attention to the feel of the press lever. After drilling, the hole has to be tapered to accept the tapered shaft of the peg. A 5 degree snub nosed tapered reamer does the job well. Turn the reamer gently and check your progress often. Do not stop turning in the same place twice. If you taper carefully you will not have to use epoxy to hold the fifth peg in place, the fit of the hole will hold the peg in place. However, don’t let that idea be too important, it is possible to crack a neck by forcing the peg into a hole that is too small for it. 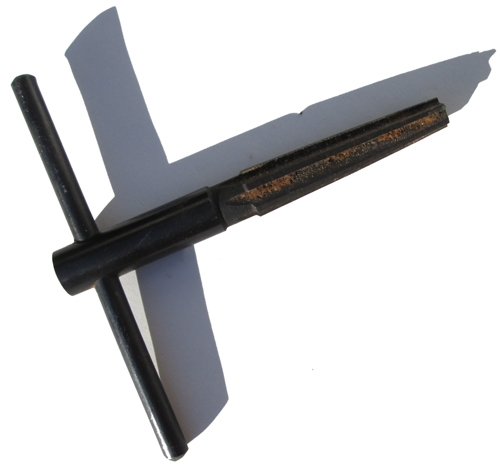 A snub nosed tapered reamer used for reaming out the hole for the fifth peg tuner in the side of the banjo neck. The fifth peg hole after reaming is complete. The pip is a miniature nut that serves the fifth string. The pip is usually cylinder shaped and made from the same material as the nut. I make mine to be about 1/8&quot; diameter at the biggest. The edge nearest the bridge should come out either even with or just behind the fifth fret. Drill the hole in the face of the fingerboard and be careful not to go too deep. It&#39;s possible to drill through to the backside of the neck! 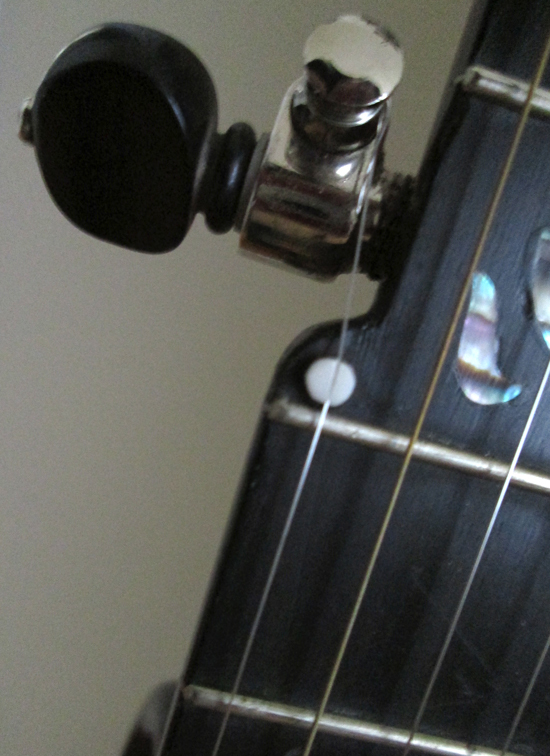 The fifth string sometimes has its own nut that is called the “pip”. My fretted banjos typically have only seventeen frets. Above the seventeenth fret I like to “scoop” the neck. The scoop allows for easier playing on the neck, yielding a mellower tone that I really enjoy. I do the job with the belt sander or with a rasp and file. I like to take that area of the fingerboard down to a little less than half of its original thickness.